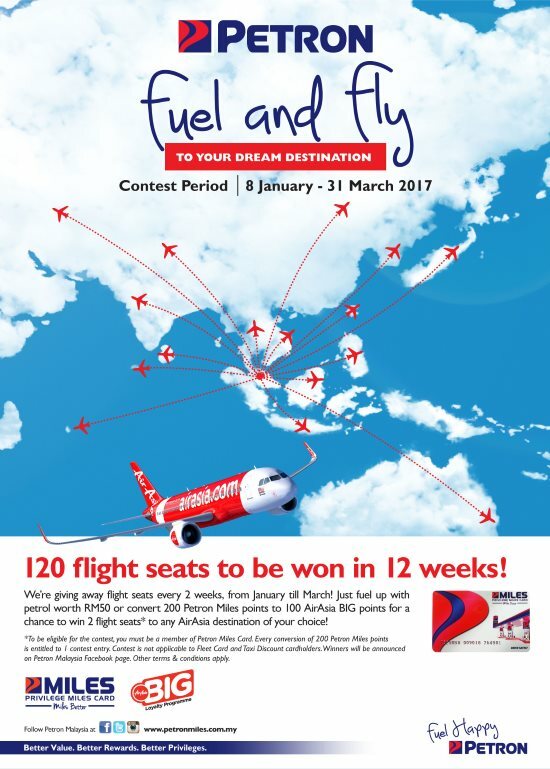 Home » AirAsia » lucky » lucky draw » petrol » Petron » purchase » spend » travel contest » Petron Fuel and Fly Air Asia Contest: 120 flight seats to be won in 12 weeks! Petron Fuel and Fly Air Asia Contest: 120 flight seats to be won in 12 weeks! Purchase minimum fuel product (Blaze 95, Blaze 97 and Blaze 100) worth at least RM50 in a single receipt via cash or credit card purchases, at any participating Petron service stations. All purchases must be swiped with a validly registered Petron Miles Privilege Card. You can also gain entry by converting Petron Miles points to Air Asia Big Points. A minimum of 200 Petron Miles points conversion to 100 Air Asia Big Points within the Contest Period will automatically be entitled for one (1) lucky draw contest entry. Visit Petron Fuel and Fly Air Asia Contest terms & conditions for more details.